In the 1970s and early ’80s I worked at the Summer House Inn in La Jolla as a combination desk clerk, switchboard operator, bell man, reservationist, and whatever odd job that needed to be done that didn’t require driving the company car. It was an okay job, nothing great, but the greatest benefit of working there was that Elario’s, at the time one of the best jazz clubs in Southern California, was perched on 11th floor of the high-rise. It was at Elario’s where I was introduced to the music of Brooklyn native and San Diego resident Lori Bell, a jazz flautist (or flutist?) in live performance. Playing with the very fine pianist Dave McKay and with her own groups, Bell’s flute work was a revelation of sorts. Her tone is firm and she shows a virtuoso’s command of the sounds it produces. Whether digging into the sub-atomic emotions that are the genius of the blues, releasing a torrent of inspired runs on the obstacle course complexities of bop or the nuanced, minor key subtleties of a ballad, Lori Bell played her flute in any fashion she chose. Delicacy and strength, firm and rhythmic, unfaltering and malleable, hers is a sound with verve and lyricism. 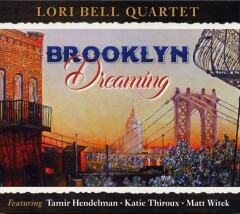 That said, Bell has released her ninth studio album, Brooklyn Dreaming, a tribute to her place of birth and where her heart and roots remain. She is joined her by Matt Witek on drums, Tami Hendelman on piano, and Katie Thiroux on bass, an ensemble reveling in what seems like telepathic communication during in both the softer and more dynamic album selections. The album is a tribute to the vital elan of Bell’s fabled native grounds, but over anything else this album’s main attraction are the top shelf performances. These sessions wails, soars and swings on the good grace of superb musicianship.Noteworthy are the hard-charging interpretations on the twisting turns of Charlie Mingus’ “Nostalgia in Times Square”; brisk, given to fast tempo changes and the odd quirks Mingus is known for in his writing, Bell’s solo is magnificent, building with simple statements and gradually accelerating the speed, upping the ante, and dancing on the edge of the rhythm section’s sublimely kept pace. Bell’s original compositions—“Times Squared,” “Brooklyn Dreaming,” “A Dog on Coney”—provide what we can take as the New York attitude: fast, in-your-face , loquacious, but friendly and swinging. Bell finds the mood, explores the variations, makes it all swing, her notes precise and rounded, fleeting and wild in their spirit. Hendelman’s piano work has that extra-sensory element suggested from before. His chords chime magically to provide a suitable push and texture to the ensemble, and his solos are rich complements to Bell’s, matching her in stratospheric outlay of ideas but adding his own deft touches. Half chords, short runs, and bell-tone octaves make him the necessary musician to have around. Likewise, the teamwork of the Witek and Thiroux rhythm section move this wonderfully realized session with an ease dually dynamic and apt. The songs cover a wide swath of styles, and the team is there, keeping the pace lively, varied, soaring. I would ask that the musicians take a bow, one by one, for the fine work they created for this very fine album.